India, the outsourcing capital of the world, is the most preferred destination for software development. With its highly skilled resources, use of latest technologies and high–end infrastructure, India can handle any type of software development. Oracle application development, embedded software development, software coding, product development, mobile application development and software testing are some of the most outsourced software development services to India. When you partner with an offshore vendor in India for software development, you will be asked to choose an offshore engagement model. Choosing the right model can be critical to the success of your project, as it can not only accelerate your software development lifecycle, but can also considerably contribute to the net profit of your company. The following are some of the offshore engagement models that you have to choose from when you outsource software development to India. If your company has a fixed set of software development requirements that you have already decided upon, then the fixed bid model will be the best suited model for you. You will have to give your offshore vendor a requirements document. Your vendor will discuss with you and decide on a timeline for each phase of the development procedure. Milestones will also be set and the payment terms will be decided on. Your offshore vendor will then quote a price based on your requirements. Once these are finalized, the actual development process will begin. Your offshore vendor will then quote a price based on your requirements. The fixed bid model does not allow the integration of any upcoming changes/ additions in the requirement that was not already mentioned in the requirements document. If your organization has software development requirements that would likely change in the future or if you would like a flexible model, then the hourly model is the perfect model for you. If your company has varied requirements that require an offshore vendor to work on based on priority, then this is the best model for you. Throughout the course of the project, the hourly model allows for changes, modifications and deletions to happen along with the expansion of the project. Your offshore vendor will work with you based on your flowing requirements. The payment happens through invoices which will be sent to you for the number of hours spent on the project. If you choose the development center model, you can hire dedicated resources from your offshore vendor’s development center and get access to teams of experts in varied software technologies. Each team would be headed by a project manager and a leader who will work with you to ensure a smooth and seamless process. Every software team would have a hierarchy of tasks and responsibilities. Whether you require software application development from scratch or you require minor changes in your software project, the development center model can give you access to software experts who will work on perfecting your project. Outsource2india is one of India’s leading providers of software development services. Outsource2india can give you access to qualified and experienced professionals with a sound domain knowledge. Outsource2india has expertise in LAMP, JAVA, Microsoft and Oracle application development. Custom software development, mobile application development and software testing are some of the other services offered by Outsource2india. When you outsource to O2I, you can expect huge cost savings, superior project control and dedicated resources. You will also have the freedom to choose an offshore engagement model that suits your business needs. Make a decision to outsource software development to India. Get in touch with Outsource2india. 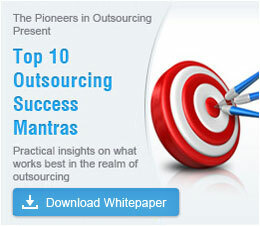 Core functional areas to pay attention to for a successful outsourcing venture. Are you unaware about which jobs can be outsourced to India?